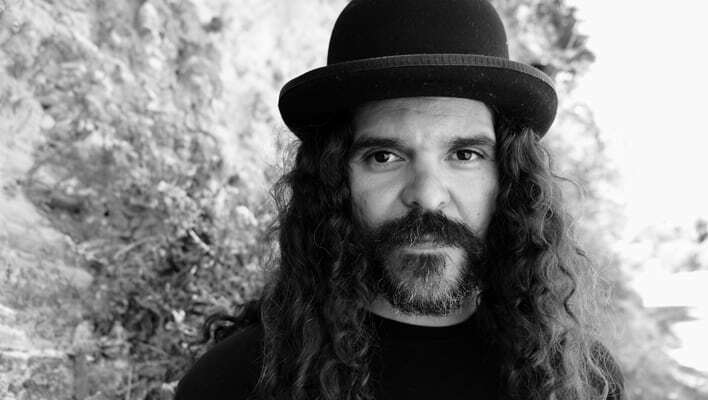 Brant Bjork, founding member of Kyuss, leader of The Low Desert Punk Band, producer, and godfather of desert rock will be adding a new title to his resume: festival founder. Behold, the first ever Desert Generator festival, happening Apr. 9 at Pappy and Harriet’s, located in the very deserty Pioneertown. A throwback to the notorious desert generator parties of Bjork’s Palm Desert youth, the festival promises to be a rocking good time with the formidable stoner rock lineup of Red Fang, Acid King, Golden Void, Ecstatic Vision, and Brant Bjork and his band. CONCERT GUIDE LIVE caught up with Bjork to talk about the festival, custom vans, and what the hell desert rock actually means. CONCERT GUIDE LIVE: What made you want to put on this festival in the first place? BRANT BJORK: Well, I’ve been playing rock music all my life, I come from the desert, and people that are aware of myself and the scene that I come from, they’re aware of the fact that we used to have parties out in our desert. I just wanted get together with some other people and put something together that represented that same spirit. CGL: For those not familiar, what is a desert generator party? BB: When I was growing up, it was the extension of, ‘Well, there’s nothing to do.’ We lived out in the desert and most of the entertainment, if not all, was centered toward entertaining old folks that had retired. There was absolutely nothing for kids to do. Someone got the genius idea, ‘What do we have plenty of? We’ve got desert.’ So let’s take a generator, let’s go out into the dirt. It was kind of an extension of the punk rock scene, the DIY element. Get the generator, get the punk bands, tell a friend, those friends tell a friend. You told people where it was, you put out flyers with little maps, and it was kind of like a treasure hunt. People would come out to the middle of the desert and there would be one little light and a bunch of people hanging out, drinking beer, doing whatever they want, the bands would play, and it was really like, no rules. The rule was have a good time and don’t bother you’re neighbor, and if you do, you’re just going to have to deal with the consequences [laughs]. CGL: So basically, there was no scene, so you created you own? BB: 100 percent. In the desert, we always looked to the punk rock scene. We didn’t have clubs. A scene is always built around this central area where people congregate: artists, musicians, freaks, weirdos, drug-pushers, everybody just congregates at this one place. For New York it was CBGB’s, for LA it was the Whisky and those other clubs. For us, we didn’t have any of that. We just took the desert. The generator party became our scene. CGL: What is it about van culture and the desert rock scene that works so well together? BB: We both, environmentally and geographically speaking, have a kinship that’s directly related to being in southern California. Custom car culture was arguably born here, and certainly the desert rock scene that I was spawned from, was arguably born in southern California, as well. We’re the freaks, if you will. Instead of having separate parties across the street, why don’t we just have one big party? CGL: Did you ever have a super cool van of your own? BB: No, I never had a van, but my best friend when I was growing up, Chris who I started Kyuss with, he had a really cool 70’s van. It certainly wasn’t like something that was custom and designed and modified, I mean, it wasn’t a work of art. We used to cruise around the desert in that thing and break out our amps and our gear and play shows. It was our cruiser for a couple years. BB: It doesn’t matter whether I like it or dislike it. What people are gonna pin on you when you step forward as an artist, you have no control over that. We used to call ourselves desert rock, but we were saying it kind of half-kidding, it was just so obvious. We said it with no intention of it being something people would say 20 years later. As far as stoner rock, that was another one that was so bizarre, but at the same time it was like, ‘Yeah, we’re kids, we were smoking pot and playing rock music [laughs].’ Back in the day I think we referred to it as punk rock, but that was only because that meant something then. Even that quickly faded. CGL: I feel like if someone hears “desert rock” they automatically think, the band is from the desert. But it’s more than that isn’t it? BB: That question directly relates to why I wanted to help put this thing together. I mean, I’ll travel the world and I’ll play a desert rock festival in Germany [laughs]. The term ‘desert’ in relation to rock music clearly has evolved into something that has nothing to do with the literal geographic desert. That’s cool with me, but I think it would be fun if we could celebrate the concept at the literal epicenter of its origin, which is the desert. CGL: You’re playing with the Low Desert Punk Band with whom you released an album in 2014. Are you guys going to be playing some new stuff too? Is there a new album in the works? BB: The new record is finished, it’s been delivered to the record label. Unfortunately it won’t be out in time for the festival, it will be out later this summer, but we certainly will be playing a couple new songs. CGL: Sort of unrelated, I saw that you saw Black Sabbath on this last tour. BB: We went and saw Sabbath in Vegas. It was a great time. They’re still rockin’, they played great, sounded awesome. One of the things I really enjoyed at the Sabbath show, and I look forward to experiencing something similar with our event, is just to see all these people that are like-minded, man. When I was a kid growing up, there weren’t too many people into Black Sabbath. To see all these people digging Sabbath, I’m like, ‘See man, there’s people out there that want this, that are into this culture, into this music,’ so that was really exciting, it was really awesome to see that.